The knee-jerk answer, the building is the San Francisco Fire Department’s Pump Station #2 – or at least it was for a hundred years, before being turned over to the SF Water Department a year or so ago. 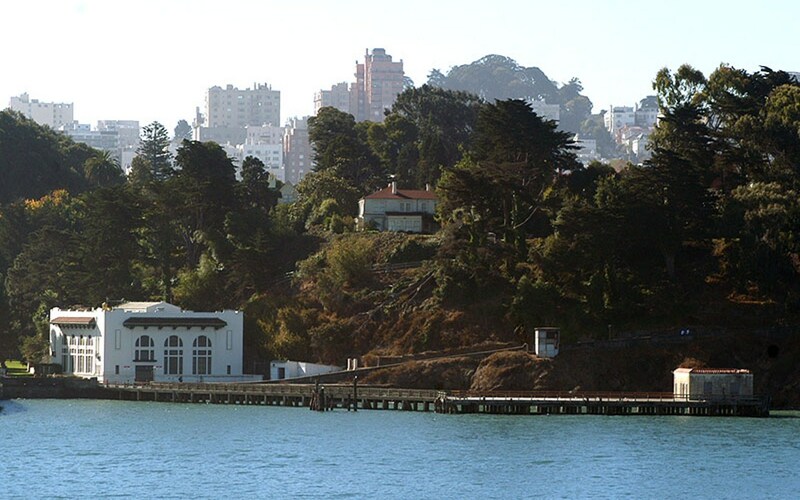 It’s easy to see; from Aquatic Park at the foot of Hyde Street, a hoot and a holler from the Buena Vista Saloon and its Irish Coffee – just look to the left at the spit of land forming one side of Fort Mason. Take a walk over; it’s not that far. Shortly after the Great Earthquake of 1906 it was decreed by the citizenry of San Francisco that never again would the town be gutted by fire following an earthquake, for lack of water to douse the flames with. The pumps, which serve in concert with another station downtown, houses, or one time housed, three boilers at the right side of the building as viewed in this picture (a 30-foot masonry smokestack once graced the southeast corner of the roof, to the viewer’s near left.) The boilers’ steam powered an electric motor through a steam turbine, which motor turned a pump, which could raise sea water to the 10-million gallon Twin Peaks reservoirs, at an elevation of almost 800 feet above the bay level, and pump it at the alarming rate of 10,000 gallons a minute. That sea water could then be dropped by gravity down to smaller reservoirs in Ashbury Heights, the Hippies’ domain in the 1970s, or another reservoir on Nob Hill. The machinery was incredibly beautiful to view – I was fortunate to get inside the building numerous times prior to the Water Department’s acquisition of it – and the 1909-era massive pumps, generators and boilers, with their dramatic “General Electric” brass nameplates, “Schenectady, NY” – and switches and valves reminiscent of Captain Nemo’s bridge on Jules Verne’s Nautilus, were a treasure to behold. And most of that remains, I’m told. Sadly, following 911 the building’s SFFD signage and its very existence and function became clouded in the name of homeland security and I haven’t been able to BS my way back inside (yet!) since 2008.